ScrollView provides scrolling for user-defined content. It can be used to either replace a Flickable, or to decorate an existing one. The first example demonstrates the simplest usage of ScrollView. Note: ScrollView does not automatically clip its contents. If it is not used as a full-screen item, you should consider setting the clip property to true, as shown above. The second example illustrates using an existing Flickable, that is, a ListView. If only a single item is used within a ScrollView, the content size is automatically calculated based on the implicit size of its contained item. However, if more than one item is used (or an implicit size is not provided), the contentWidth and contentHeight properties must be set to the combined size of its contained items. If the content size is less than or equal to the size of the ScrollView, it will not be flickable. The horizontal and vertical scroll bars can be accessed and customized using the ScrollBar.horizontal and ScrollBar.vertical attached properties. The following example adjusts the scroll bar policies so that the horizontal scroll bar is always off, and the vertical scroll bar is always on. 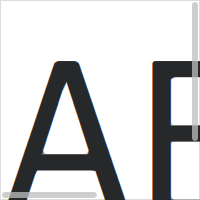 On touch, ScrollView enables flicking and makes the scroll bars non-interactive. When interacted with a mouse device, flicking is disabled and the scroll bars are interactive. Scroll bars can be made interactive on touch, or non-interactive when interacted with a mouse device, by setting the interactive property explicitly to true or false, respectively. See also ScrollBar, ScrollIndicator, Customizing ScrollView, Container Controls, and Focus Management in Qt Quick Controls 2. The list contains all items that have been declared in QML as children of the view. The list contains all objects that have been declared in QML as children of the view. This property holds the height of the scrollable content. If only a single item is used within a ScrollView, the content size is automatically calculated based on the implicit size of its contained item. See also contentWidth and Sizing. This property holds the width of the scrollable content. See also contentHeight and Sizing.